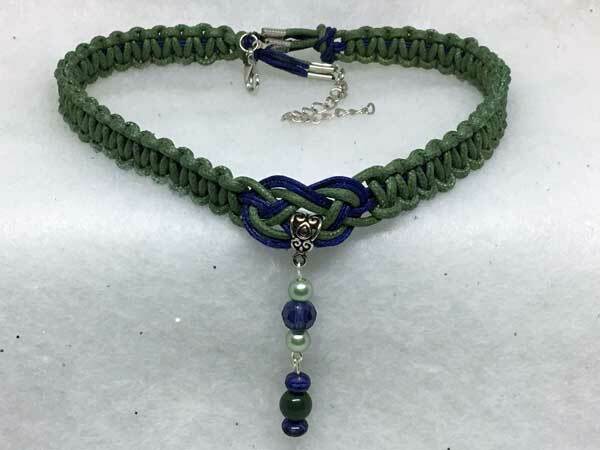 This necklace is made using waxed cord in combination with bamboo cord. The length can vary from about 16 to 19 inches with a center jeweled piece that adds over 2 inches. It is done in medium sage green and navy blue. The jeweled piece starts with a large, fully-faceted navy glass round, surrounded by light sage pearl rounds. Hanging separately from this, for more movement and sparkle, is a round green stone in the same shade as the cord. It is surrounded by faceted, blue lapis rondelles.